The slip knot was a knot designed to snare wild game. By association, could it also mean the snares of love? 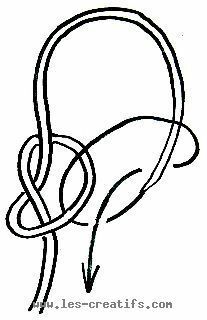 — the knots called “lacs des amoureux” (lovers' slip knots) in France were traditionally used by sailors in their marriage proposal: they sent their chosen one the design shown in this sketch, BUT WITHOUT PULLING THE KNOT TIGHT. If the girl sent the knot back tied, it symbolized the two lovers' hearts entwined, just like in the photograph. In other words, wedding preparations should get underway immediately. If the knot came back, alas, untied... I think you've got the picture. There are several different types of 'lovers' snares'. The one shown here was the most common. It's easy to make, since it's composed of two overhand knots; the second one being started inside the first. When combined in different ways, overhand knots will enable you to create a whole range of decorative designs and Chinese knots. These are also frequently used in macramé.